REGINA, Dec. 6, 2017 /CNW/ - Input Capital Corp. ("Input" or the "Company") (TSX Venture: INP) (US: INPCF) announces that the Board of Directors has declared a cash dividend of $0.01 per common share for the quarter ending December 31, 2017, representing $0.04 per share on an annualized basis. The dividend is payable on January 15, 2018 to shareholders of record on December 31, 2017. Input is an agriculture commodity streaming company with a focus on canola, the largest and most profitable crop in Canadian agriculture. Input enters into multi-year canola streaming contracts with canola farmers in western Canada. Pursuant to the streaming contract, Input purchases a fixed volume of canola annually for the duration of the term of the contract. 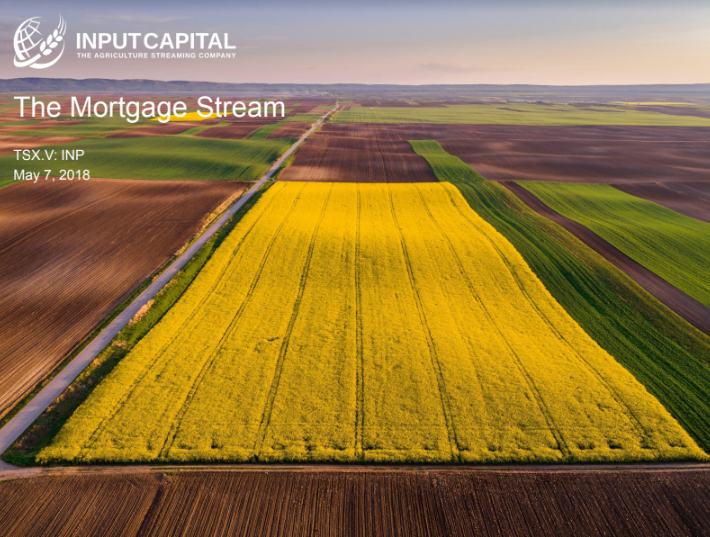 Input is a non-operating farming company with a diversified portfolio of canola streams, all of which produce canola and revenue for Input within a year of being signed. Input plans to grow and diversify its low cost canola production profile through entering into additional canola streaming contracts with farmers across western Canada. Input is focused on farmers with quality production profiles, excellent upside yield potential, and strong management teams. This release includes forward-looking statements regarding Input and its business. Such statements are based on the current expectations and views of future events of Input's management. In some cases the forward-looking statements can be identified by words or phrases such as "may", "will", "expect", "plan", "anticipate", "intend", "potential", "estimate", "believe" or the negative of these terms, or other similar expressions intended to identify forward-looking statements. The forward-looking events and circumstances discussed in this release may not occur and could differ materially as a result of known and unknown risk factors and uncertainties affecting Input, including risks regarding the agricultural industry, economic factors and the equity markets generally and many other factors beyond the control of Input. No forward-looking statement can be guaranteed. Forward-looking statements and information by their nature are based on assumptions and involve known and unknown risks, uncertainties and other factors which may cause our actual results, performance or achievements, or industry results, to be materially different from any future results, performance or achievements expressed or implied by such forward-looking statement or information. Accordingly, readers should not place undue reliance on any forward-looking statements or information. Except as required by applicable securities laws, forward-looking statements speak only as of the date on which they are made and Input undertakes no obligation to publicly update or revise any forward-looking statement, whether as a result of new information, future events, or otherwise.